The 64m radio telescope of the Parkes Observatory in Parkes, New South Wales, Australia is an important, Southern hemisphere radio telescope. Parkes is a town in the Central West region of New South Wales, Australia. It is the main settlement in the local government area of Parkes Shire. Parkes had a population of 11,408  as at 30 June 2016. Parkes was founded in 1853 as the settlement Currajong, named for the abundance of kurrajong trees in the local area by the settlers, but was then known as Bushman's (from the local mine named Bushman's Lead). 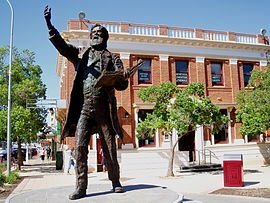 In August 1873, Henry Parkes (later Sir Henry) visited the area and in December 1873 the town was officially renamed Parkes in his honour . (Sir Henry Parkes is recognised in Australia as having played an instrumental role in Australia becoming a unified and federated country.) In March 1885, Parkes was proclaimed a town. Bushman's Lead Post Office opened on 1 August 1872 and was renamed Parkes in 1873. The railway from Molong via Parkes to Forbes, was officially opened on 18 December 1893. Parkes attracted significant attention during the gold rush of the 1870s onwards, and even to this day modern mining companies still have sites in the region. In 1939, Parkes became a sister city with Coventry in the United Kingdom. This was in honour of the fact Sir Henry Parkes was born in Coventry. A rich variety of farming is conducted in the region immediately surrounding Parkes, although the staple farming products are wheat and wool. Parkes prides itself on its modernising ideology, historically and culturally. The Dish, although set in Parkes, was largely filmed in Forbes' historic precinct. This is due to very few historic buildings remaining in Parkes. Parkes is also home to the Parkes Spacemen rugby league club. The area is supported by a gold and copper mine, Northparkes, 27 km north-north-west of the town. Parkes became a key country location after the completion of the railway in 1893, serving as a hub for a great deal of passenger and freight transport until the 1980s. Unfortunately, as successive governments reduced the NSW country rail systems, this part of the economy was largely lost to the community. Periodically governments and businesses have raised the topic of an "inland port" whereby Parkes Regional Airport would be expanded considerably to serve as a starting point for domestic and international freight destined for areas in NSW, Victoria and Queensland. Environmental studies are complete, development consents are in place, contracts have been exchanged, some properties have changed hands and studies are continuing. Parkes Shire Council, with approval from the State Government, has rezoned 516 hectares of agricultural and industrial land on the western edge of the town for the development of the Parkes National Logistics Hub with an additional reserve of over 100 hectares. The site has been specifically designed for the 24-hour, 7-day-per-week operation of a multi-modal transport facility. FCL runs a significant intermodal operation at Goobang Junction on Parkes' western outskirts. On 20 October 2006, Premier Morris Iemma opened Specialised Container Transport's intermodal terminal nearby on a 296 hectare site. It has 5 km of rail sidings, a 7,400 square metre warehouse and about 40 staff. An even larger terminal to be sited nearby is also being promoted. The Roads & Maritime Services' Western Regional Office is located in Parkes. Essential Energy also is represented by a training and maintenance centre. Main tourist attractions are the CSIRO Telescope 20 km north of town on the Newell Highway, Bushmans Hill, and the War Memorial Lookout. Nearby there is the Goobang National Park, and Peak Hill which features an Open Cut Mine that can be toured during holidays. There are also many great parks. Parkes has a high percentage population of school age students and an associated number of schools. Parkes Public School was founded in 1876 under Archibald Booth as educator, Parkes East Public School and Middleton Public School are also in the area. Holy Family Catholic School and Parkes Christian School operate in the town, with Saint Patrick's School Trundle and St Joseph's School, Peak Hill also operating the shire. Parkes High School is the main public high school for the town. Parkes Christian School offers education for students from Kindergarten to Year 10 in 2013, extending to Year 11 in 2014 and Year 12 in 2015. Many Parkes students also attend the nearby Red Bend Catholic College in Forbes. Parkes is located on the Australian transcontinental railway line, and the Newell Highway linking Victoria to Queensland. Parkes has a warm temperate climate, with significant temperature variations between summer and winter. Under the Köppen climate classification, Parkes lies in the transitional zone between humid subtropical (Cfa) and semi-arid (Bsk) climates. Summer maximum temperatures average out at 32 °C (90 °F), however frequently reach 35 °C (95 °F), and there are usually a few days that top 40 °C (104 °F) each year. Winters are cool and sunny, however occasional cold fronts can bring prolonged periods of light, misty rain with low maximum temperatures. Rainfall in spring and summer usually falls as thunderstorms, with an annual average of 587.5 mm (23.13 in) of rainfall. Extreme temperatures have ranged from −4.2 to 45.5 °C (24.4 to 113.9 °F). Parkes is considerably sunny, having around 135.0 clear days annually. Parkes has a local bus service provided by Western Road Liners, which acquired Harris Bus Lines in March 2006. The Indian Pacific also stops twice a week, as well as the Outback Xplorer service, run by NSW TrainLink, which heads to Broken Hill on Mondays and Sydney on Tuesdays. Parkes railway station is situated on the Broken Hill railway line, and opened in 1893. A smaller station served Parkes Racecourse between 1923 and 1937. Parkes Regional Airport is served regular air services to Sydney operated by Regional Express Airlines. The airport is located approximately five kilometres east of the central business district. 2PK AM 1404 (talkback radio format aimed at listeners 35 years+ most prograns relayed from 2SM, Sydney): owned by Broadcast Operations Group. PH FM 88.0 (community access radio station based in Peak Hill, 50 km north from Parkes). ROK FM 95.5 (mixed music format aimed at 18 –39 years market – Top 40 and Classic Hits): owned by Broadcast Operations Group. ABC Central West NSW 2CR 549 AM – part of the ABC Local Radio network. Some stations from Dubbo and Orange also transmit into Parkes and the surrounding region. The other networks broadcast nine additional channels: 7Two, 7mate, 9GO!, 9GEM, ABC2, ABC3, ABC News 24, SBS Two, One HD and Eleven. There are two local newspapers servicing Parkes. The is published on Monday, Wednesday and Friday. It is owned by Fairfax Media. The Parkes Phoenix is a free weekly paper that is published on Fridays. It is part of the independently owned Phoenix Group of papers. Parkes hosts the annual Parkes Elvis Festival. It is held in early January to celebrate Presley's birthday and to boost tourism. During World War 2, Parkes was the location of RAAF Station Parkes, and RAAF No.18 Inland Aircraft Fuel Depot (IAFD), completed in 1942 and closed on 14 August 1944. Usually consisting of 4 tanks, 31 fuel depots were built across Australia for the storage and supply of aircraft fuel for the RAAF and the US Army Air Forces at a total cost of £900,000 ($1,800,000). ^ "3218.0 Regional Population Growth, Australia, 2016 (Urban Centre)". Australian Bureau of Statistics. August 2017. Retrieved 9 August 2017. ^ a b "3218.0 Regional Population Growth, Australia, 2016". Australian Bureau of Statistics. Australian Bureau of Statistics. 28 July 2016. Retrieved 9 August 2017. Estimated resident population, 30 June 2016. ^ a b c "Parkes (Macarthur Street)". Climate statistics for Australian locations. Bureau of Meteorology. April 2013. Retrieved 26 April 2013. ^ "Early History of Parkes". Parkes Shire Library. Retrieved 6 November 2006. ^ a b "Bushmans and Parkes History". Parkes Early History. Parkes Shire Library. Retrieved 26 April 2013. ^ "Parkes Shire Council – History – Parkes". Parkes Shire Council. Retrieved 26 April 2013. ^ Martin, A. W. "Parkes, Sir Henry (1815–1896)". Australian National University. Retrieved 26 April 2013. ^ Premier Postal History. "Post Office List". Premier Postal Auctions. Retrieved 26 May 2011. ^ "(FROM OUR CORRESPONDENT.)". The Sydney Morning Herald. National Library of Australia. 19 December 1893. p. 5. Retrieved 27 April 2013. ^ "Sister City". Parkes Shire Council. Retrieved 2 March 2013. ^ "Parkes Post Office". New South Wales State Heritage Register. Office of Environment and Heritage. H00717. Retrieved 18 May 2018. ^ "Parkes Railway Station group". New South Wales State Heritage Register. Office of Environment and Heritage. H01220. Retrieved 18 May 2018. ^ "Parkes National Logistics Hub". Parkes Shire Council. Retrieved 28 September 2010. ^ "SCT opens Parkes terminal". Railway Digest. Australian Railway Historical Society. 44 (12). December 2006. ^ "Parkes Racecourse Railway Station". www.nswrail.net. Retrieved 7 April 2008. ^ "2PK Parkes and Central West Radio". 2pk.com.au. ^ "Personal Home Financing Methods | The PHFM Network – Helping Australians". Phfm.net.au. Archived from the original on 31 January 2013. Retrieved 23 December 2012. ^ "Welcome to leccowra.com.au". Rokfm.com.au. Retrieved 2012-12-23. ^ "Sky Racing – Number one in racing". 2ky.com.au. Retrieved 2012-12-23. ^ "Parkes News, sport and weather". Parkes Champion-Post. Retrieved 2012-12-23. ^ "Free newspaper group bucks regional media trend". ABC News. 2016-01-21. Retrieved 2017-03-04. ^ a b "Bogan Gate: Australian history merges in unique moment!". History Parkes. 10 March 2017. Retrieved 22 October 2017. ^ "Countrylink Parkes Elvis Festival". www.countrylink.info/. Retrieved 9 January 2009.